This article is for any of those designers who have ever had issues which make it difficult to be productive at a traditional workstation. Here are a few examples: one hand doesn't cooperate, you have difficulty typing, or can't sit upright in your everyday office chair. As a designer, my job is relatively easy on my body. I'm worked a number of physical-labor jobs in my life and I am so grateful that my daily work does not leave my entire body exhausted (like those plant nursery-worker and home improvement warehouse jobs I had many years ago). But still, there are sometimes when bodies just don't cooperate with our deadlines, and eventually, we'll probably all need to find creative ways to get our work done when certain body parts are working against the deadline. I've compiled some ideas that I hope will help some of my fellow designers still get work done on physically rough days. Let's say one of your hands doesn't work: maybe you broke your arm, or had hand surgery or something along those lines. For whatever reason, one hand is non functional. One solution: Change hands. If you're right handed, try working left handed. Move the mouse over to the other side. At first I tried just moving the mouse to the left of my keyboard. But even though I was working left handed, my left hand still knew that "left click" was supposed to be done with my index finger, and "right click" was supposed to be done with my middle finger. So I had to also change primary button as well. It was a little slow at first, but I got used to it for the most part. To change the primary mouse button, go to System Preferences > Mouse. Use speech recognition: This doesn't necessarily have to do with working one handed. But it can come in handy if typing is really difficult and you've got long emails to put together. Did you know that the Mac has built-in speech recognition? 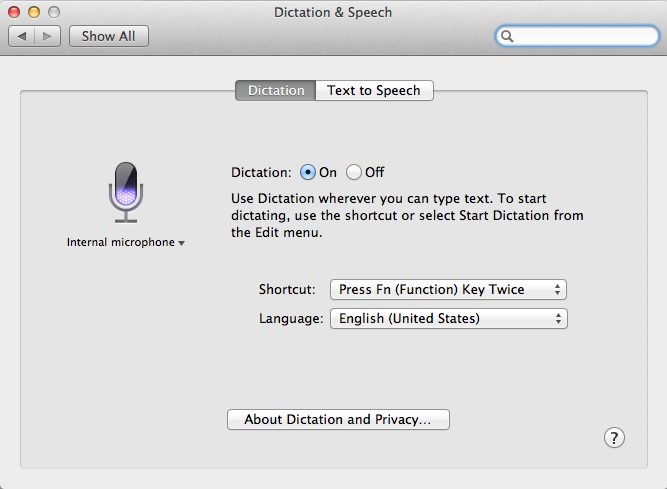 After a little digging around in System Preferences, I found Dictation. If you've ever used Siri on the iPhone, you'll find that Dictation works exactly the same, complete with autocorrect (or auto Incorrect, depending upon how it interprets your speaking). After using Dictation, I usually have to do a little clean up work. But Dictation can take a lot of the trouble out of typing complex emails. Unfortunately dictation does not work in InDesign (I wish I knew why). But it works great when writing emails. Step 1: Chaise Lounge: Position a chaise lounge on the floor in front of your desk. Because the head and feet can be raised independently, you can put both at the correct angle for whatever your body needs. Step 2: Move the monitor close to the edge of the desk and tilt it downward. Step 3: Get a lap desk and move your keyboard and mouse down there. In this case, a small wireless keyboard (without a 10 key) would work much better than a large wired keyboard. Step 4: Zoom in. Now, we all know how to zoom in our favorite Adobe programs using the marquee zoom, but do you know how to zoom in on everything? When sitting upright at a desk, those Adobe panel menus are a perfectly reasonable size. But when you're several feet away from the screen, those panel menus suddenly seem ridiculously small. I used to think that the only way to increase the size of the panel menus was to decrease the resolution of my monitor, but the problem with that is that you lose way too much screen real estate once. I found a much better solution. Zooming in on the OS level! Watch the short video below for a quick demo. This feature would also be really useful if you're screen-sharing from a small screen onto a larger screen. 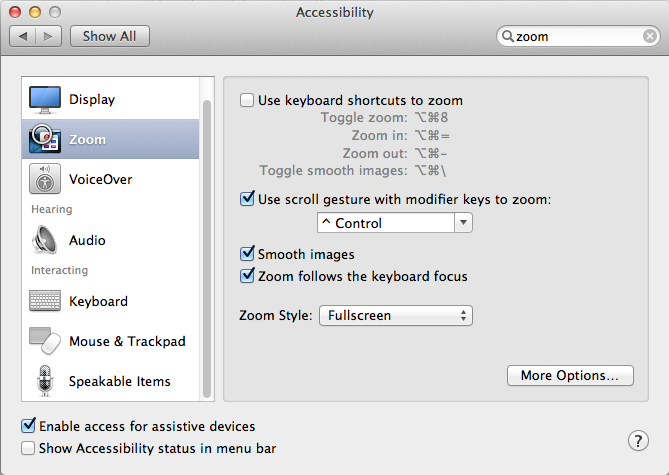 Step 5: Giant Cursor: If your cursor is just too dang small and you keep losing it, go to System Preferences > Accessibility > Display. 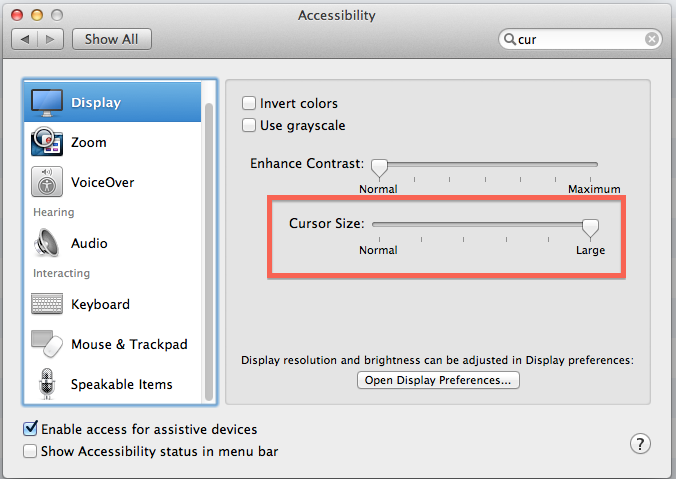 Change the cursor size from Normal To Large. The cursor will then display about ten times larger than normal. (I wanted to take a screen shot demonstrating how giant the cursor becomes, but whenever I tried, the cursor is either not included in the screenshot, or shown at its regular miniature size.) I also find Giant Cursor useful when doing training. The people watching may not be as familiar with the software as I am, so having a giant cursor makes easier for them to follow along. I hope you find these tips useful. If you use any of these tips, I love to hear about it. Please leave a note in the comments. And if you know why Dictation doesn't work in InDesign, do tell!